A few weeks into the always fun Pac-12 play, the league is shaking itself out like I thought. Arizona would succeed, Arizona State wouldn’t, and Oregon was a complete mystery. Each Pac-12 team brims with talent, regardless of ranking. The ephemeral beauty of the game itself warrants a look into the entire league, and see who is where as of now. 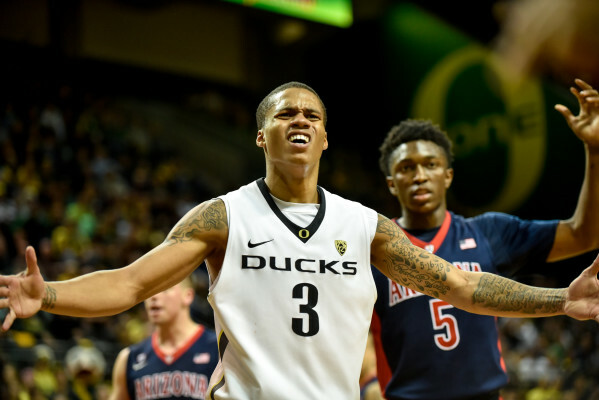 Joe Young looking confused against Arizona earlier this year. The Wildcats were the clear cut favorites coming into this season. Coming off a loss to the Wisconsin Badgers in last year’s Elite-8, the Wildcats were determined to prove that they could come back and run train in the Pac-12, despite losing players like Nick Johnson and Aaron Gordon to the NBA. The Wildcats suffered one tough loss this year to Oregon State, but they redeemed themselves with a huge win over Utah. Arizona is still the heavy favorites to take the Pac-12 crown. People expected Utah to be good, but they didn’t expect them to be this good. The Pac-12 is filled with talent from top to bottom, and Utah just happens to be exploiting that talent very well thus far. Despite a tough blowout loss to Arizona, Utah is literally dominating the Pac-12. In all four wins in conference play this year, Utah has combined to win by an average of 24.5 points per game. Right now, Utah is in the mix for the top of the Pac. The Cardinal from Palo Alto are another steady surprise this year. After a very disappointing season this past fall in football, all hopes turned to basketball, and the Cardinal seem to be living up to the moment. They too, have only lost one game in conference play, a tough loss to the Bruins down in Westwood. Up next for Stanford – Arizona on January 22nd. Depending on how this game goes, the entire landscape of the Pac-12 could completely change. Led by Gary Payton Jr, the Beavers have started out the 2015 Pac-12 campaign very successfully. They pulled off a huge upset against Arizona in Corvallis, but followed that with a loss to Washington. The name of the game for the Beavers is consistency, and if they can figure out how to stick together down the stretch, we might be seeing Oregon State make a nice push into the tourney. At this point, we really never know what to expect from the Bruins. While at home this season, the Bruins have only lost one game. Out of six games on the road, the Bruins have lost all six. They show a lot of promise, and have a very young, well-rounded team. But, for a team to contend in the long run, especially when it comes time for the tourney, it needs to learn how to win on the road, or its chances of doing anything go right out the door. Despite being right in the middle of the Pac, and having a 9-8 record overall, the Cougars have been a surprise as of late. Yeah, the Cougs might have lost to Stanford and Oregon State, but they did reel off three big victories in a row against California, Washington, and Oregon. Washington State lacks depth, so nobody knows how much longer it can sustain playing at a high level. To start off the season, the Huskies went 12-0. It looked as if the Huskies would be a top seed in the Pac-12. Right before Pac-12 play was slated to start, the Huskies lost a tough game to Stony Brook at home in Seattle. The bad luck carried over into conference play, as the Huskies lost its first three conference games. After beating the Beavers and the Ducks, Washington might have figured out how to get back to its winning ways. For now, Washington is the Pac-12’s biggest question mark moving forward. Can the Huskies keep winning, or will they lose another block of games in a row? Should be interesting to see. Oregon winning its game against Oregon State – and the shoe battle as well. Despite the Ducks’ losing three would-be starters before the season started, a biased Ducks fan like me still had hope that they could play themselves into a bottom spot in the tourney. 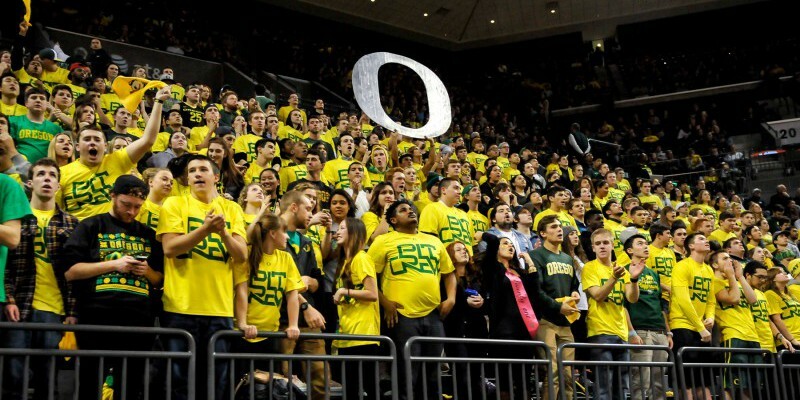 The Ducks looked very good early on in the season, until getting blown out inside Matthew Knight Arena against Arizona. The Ducks followed this game with a boring win over Arizona State, then consecutive losses to WSU and UW. The Ducks, too, lack depth on their roster. If they don’t figure things out and turn them around quickly, they also might have to kiss their tourney hopes good bye. The start to this season has been very disappointing for the Colorado Buffaloes. Like the Bruins of UCLA, the Buffaloes are still winless on the road this season. The Buffs have lost their last three games in a row: to Utah, Arizona and ASU. Their next two games are at home against Washington and Washington State. If the Buffs want any chance to make the tourney this year, they must turn their fortunes around starting with the Huskies on Thursday. At 11-7, the Golden Bears are struggling to stay alive in the Pac-12. Like so many other Pac-12 teams this year, the Bears started out their season very strong. The Bears have lost six of their last seven games, with the last four games being losses to Pac-12 opponents. The Bears have a chance to redeem themselves this Thursday against a weak Arizona State team, before facing off against conference powerhouse Arizona. Like all other teams in the lower tier, the Bears don’t have much more time to turn their season around. Yet another disappointing season for the Trojans of Southern Cal. This year has been filled with ups and downs for the team hailing from Los Angeles, California. Anyone’s gut instinct would tell them that the Trojans are once again not contenders to make the tourney this year. But, we have learned our lesson in previous years, and that is to never count a team out. The Trojans have a record above .500 right now, but the time to turn around their season is diminishing. Looks like another tough season for Southern Cal. 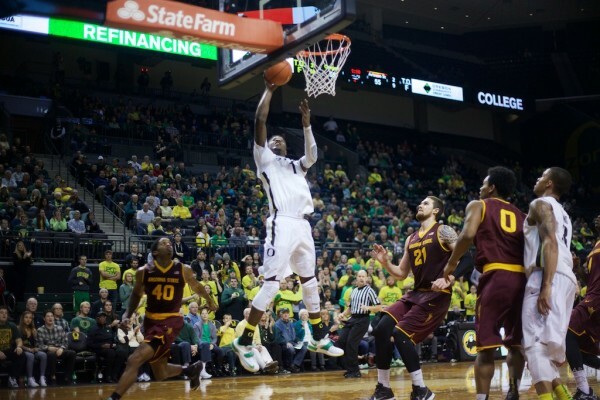 The young guys helped lead Oregon to a close win over Pac-12 foe Arizona State. Everyone knew the discrepancy between the two Pac-12 teams in the beautiful state of Arizona. The Wildcats would dominate, the Sun Devils not so much. That is exactly what has happened thus far in Pac-12 play, and by the looks of it, it seems like this trend will continue. The Sun Devils have many talented players, but they can’t seem to pull it all together. With their last win being a big win over Colorado, the Devils have something bright to look at. Still, they haven’t done enough this season, and the poor play is only killing their chances of making the tourney. Players like Jordan Bell will need to play well if the Ducks hope to advance out of the Pac-12 this season. It is not terribly surprising to see where the Pac-12 is so far this season. The two Arizona teams are polar opposites – one Oregon team is at the top, while the other one is almost at the bottom. We, as fans, have been treated with great basketball so far, and based on precedence, I will go on to say that the rest of this season is shaping up to be historic. Based on last year, I think the top seven teams in the Pac-12 could ultimately make it to the tourney. There is plenty of time to change things around; the top teams need to continue playing well, the middle teams need to play more consistently, as they have shown signs of greatness, and the lower teams are almost out of luck. My pick to win the conference this year….. the ARIZONA WILDCATS! Stay tuned to FishDuck.com for more Pac-12 Men’s Basketball news and updates.